I'll be the first to admit that I have no clue how to live zero-waste. I believe in protecting our planet, sure, and I always bring my own bags to the grocery store, but living totally sans waste? I'm going to need some help with this one. So naturally I turned to the pros for guidance. Enter: Sara Weinreb, an expert in sustainability, a facilitator for businesses that focus on environmental change, host of her very own podcast, and one of our favorite follows on Instagram. Weinreb shared some of her tips for creating a zero-waste tool kit and learning how to reduce our impact on the environment. Besides sharing some pretty shocking facts and stats, she made me realize that living a zero-waste lifestyle wasn't as daunting as I originally believed it to be. Keep scrolling for her best tips on living more sustainably. Sara's most important tip? "Before you buy something or use something in your home that will need to be disposed of, stop and ask yourself if it's the best, most green option. For example, if you're hungry and stopping at the bodega to get a snack and grab a protein shake, stop and think—maybe you can get an apple or banana instead. If you're about to use a paper towel to clean up a spill, can you use a sponge? Each time you take a step back, you're giving yourself an opportunity to use less waste." Sara recommends staying prepared with a "zero-waste tool kit" so you can always choose the more sustainable option. "My tool kit includes a reusable coffee cup, a metal straw, a set of bamboo cutlery, a water bottle, a Stasher bag, and a reusable tote (when I have room!). Always having these items on hand ensures I don't need to use a plastic fork at an event or with my Sweetgreen for lunch, don't need to waste a cup at the coffee shop, and more. By being prepared, you can drastically cut down your usage of single-use plastics (and doesn't it just feel better to drink your coffee out of a real cup?)." Let's bring it back to grade school for a second and talk about the four R's (refuse, reduce, reuse, recycle). I don't know about you guys, but it seems that at some point between eighth-grade graduation and entering the "real world," I completely forgot about the "refuse" step and went straight toward reusing and recycling. Sara seems to agree: "There's so much emphasis on recycling and compostable plastics, but the best item is the one you don't need to dispose of! Recycling is kind of a hot mess at the moment, and only a small fraction (under 10%) of the plastic we produce is actually getting recycled—plus much of it's contaminated because of people not cleaning what they're recycling. "Compostable plastics seem cool, but they're almost impossible to compost since they need commercial processing. For this reason, try to bring your own container (to a coffee shop, to shop in the bulk bin, etc.) or make something yourself. You can also avoid packaging by putting produce directly into your shopping cart. Refuse is always the first step!" Sara's next tip for zero-waste living is simpler (and less gross) than it seems. "Don't worry—you don't need to actually dig through it!" she says. "But keep an eye on what you're throwing out and evaluate if there's a way to reduce your waste. Are there reusable options? 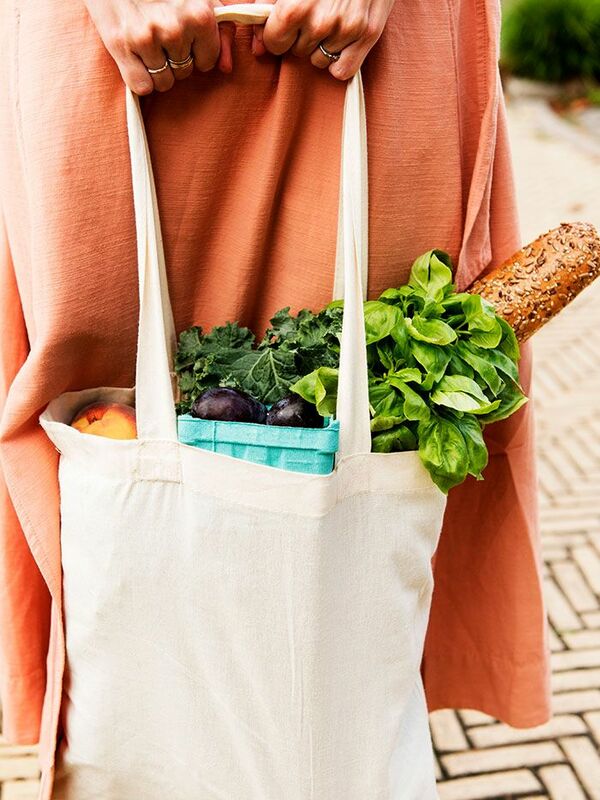 Can you make something yourself instead of buying it in plastic? Keep an eye on your trash and recycling for a couple of weeks and you'll have a lot of answers." "Sustainable living isn't necessarily easy, and our systems are not set up to support it," Sara assures us. "We can all only do our best and talk about it with others. I love hearing peoples' 'failures' because that means they're recognizing areas in their lives where they can reduce their waste. Most people don't even notice that! Awareness is a great first step, so trying your best and explaining your new habits to others can go a long way." Have more questions on living zero-waste? Let's chat about it in our secret Facebook group.